You have landed in Leh and first thing you notice is the cluster of white fluffy clouds plunging to hug the horizons and the brightest, bluest skies you will ever see. For a first timer in Leh, the excitement (Read: anxiety) is all about trying to breathe. Every breath becomes precious and every step taken forward reminds you that you have a respiratory system to value! (Especially when you take a flight to Leh, instead of going by road). While the first impressions of Leh might be of the magnificent skies, a second, closer look will make you appreciate the white specs of Chortens (stupas with Buddhist relics) scattered across dusty landscapes. The city of Leh is a melange of interesting architecture, picture perfect landscapes, sweeping views of the Himalayas, vibrant monasteries and colourful local markets. In my recent trip to the Ladakh, the stay at Leh was characterised by all these and more: a day full of rainbow sightings, random dances in the main Leh market, door hunting in the monasteries, chasing sunsets at the Shanti Stupa and not to forget climbing four floors umpteen times a day to reach my hotel room (cribbing at first but not parting with it later). Enter the painted red door of the Stok palace and climb up a rickety staircase to reach the open courtyard of a living palace. Seemingly quiet, this royal palace is partly the summer residence of Ladakhi royalty from the Namgyal dynasty and partly converted into a heritage hotel. With quaint red windows and an elegant facade, it sits atop a hill overlooking the Indus Valley, dotted with trees. Most of the interiors are painted artistically: especially the wooden Ladakhi T-beams. Head to the museum where traditional Ladakhi jewellery is displayed along with a lavish collection of ancient and extremely rare Buddhist Thanka paintings. There are weapons, ceremonial dresses and vessels on display too. Hemis monastery: The Hidden one. After visiting Stok Palace, head straight to the monastery that lies hidden away, built strategically so, to protect it from invasion. Hemis monastery is said to be the biggest and wealthiest monastery in Ladakh, home to a copper guild statue of Buddha with stupas embedded with gold and precious gems and a statue of Guru Padmasambhava (also known as the second Buddha). The monastery has a massive courtyard with colourful facades and two main Lhakhangs (temples). However, you must spare at least one hour to visit the underground museum (where photography is prohibited) to savour and absorb all that is exhibited. This monastery also hosts two very popular Buddhist festivals: Hemis and Naropa festival. The former is to celebrate the birthday of Guru Padmasambhava and the latter is known as the Kumbh mela of Ladakh which includes the ceremonial unfurling of the largest silk embroidery of Buddha Amitabha, a devotional art piece displayed only during this festival. Intrigued? Here is an extensive coverage of Naropa festival. Next up your list, should be Thiksey monastery, affiliated to the Gelug sect of Tibetan Buddhism. With over 200 steps, the climb may be daunting for some ( when breathing is already an issue), but once you are up, pretty flower beds in front of painted frescoed walls welcome you to a Gompa that is similar to the famed Potala palace in Lhasa, Tibet. Behind the red, ochre and white facades of this monastery lies a temple dedicated to Tara, a two storey majestic statue of Maitreya Buddha (future Buddha), the Lamokhang temple and an assembly hall. The murals in the courtyard are absolutely splendid and climbing further up can give you panoramic views of the Leh city. To reward yourself after the descent, head to the cafe downstairs for one of the best Ginger Honey lemon tea in the region. You need to visit Leh palace, not for the palace but the views it offers. 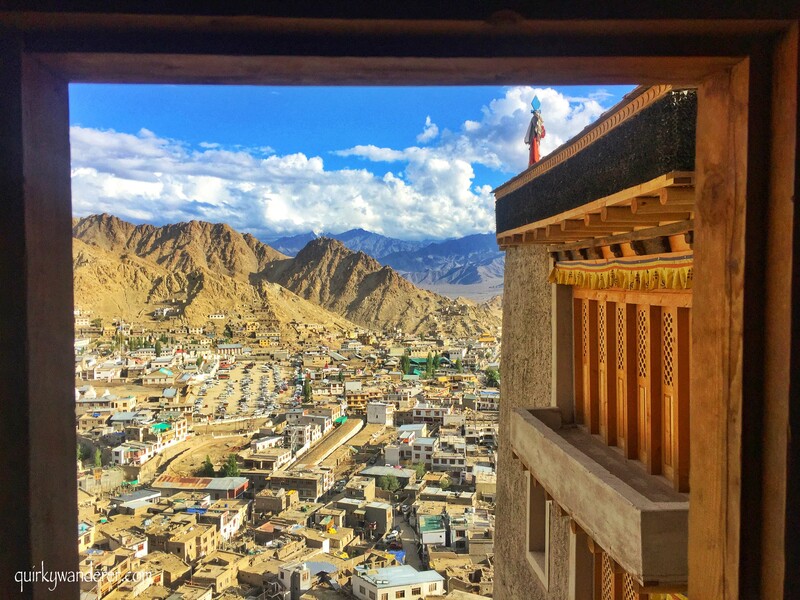 Honestly, the interiors of this oldest palace of Leh may be a letdown with its rusty smells and dilapidated condition, but the views of the Leh city from the many levels of the Leh palace are simply outstanding. This palace, currently maintained by the ASI, was built in the 16th century by King Sennge Namgyal. Once the Dogra rulers captured Ladakh, the Leh palace was abandoned and the family moved to Stok Palace. Visit it in early evening to see the shades of the sun playing on the mountains and the city lit up with natural sun light. The wooden beams and windows provide ideal photography frames and each level you climb (the palace has a total of seven) gives you another perspective. The perfect way to end Day 1 would be to not do anything but treat yourself to a sunset at Shanti Stupa. It may be windy, it may even be cloudy but as you circumambulate the monument, the peace envelopes you. A perfect place to put your tripod and record a time-lapse of the clouds moving across the mountain ranges and the sky changing colours. Situated atop a hillock in Chanspa in Leh, this stupa or Chorten houses the relics of Buddha at its base and was built in 1991 by Japanese and Ladakh Buddhists. Apart from its religious reverence, it is known for its 360 degree panoramic views and this is why your chase for a memorable sunset in Leh ends here. Shey palace holds a special place in my heart as this is where I spotted the double rainbow. A dusty winding road leads you to this beige coloured palace with a gompa that houses a copper guild statue of the Shakyamuni Buddha, which is believed to be the second largest statue of this kind in Ladakh. Currently in ruins, the Shey palace was built in 1655 by the king of Ladakh Deldan Namgyal. The way to the place is flanked with many Chortens, numerous prayer flags and carved prayer stones with inscriptions. If you want to witness a peaceful, lesser known side of Leh, head straight to Sindhu ghat on the outskirts of Leh for a rendevous with the river Indus. Our country was named after this river and while many might wonder what you can actually ‘see’ here, it is a place to see a beautiful river against the backdrop of tranquil hills. You can dip your feet in the river, facing the greenery and spend time at the clean ghats for a while before venturing into the main city of Leh and getting enthralled by its markets and the chaos they offer. One of the most fulfilling experiences for me in Leh, was strolling down the main market and watching the chaos of the bustling streets. There are shops selling jewellery, woollens, curios, souvenirs, fruits and almost everything under the sun. If you are lucky, you will hear sounds of songs and dance when you are in the heart of Leh city. This is evidence of a Cultural show happening in the main market area. Local Ladakhi women dressed in their traditional attire perform on folk songs and it is indeed a sight to experience. They will wow you with their simplicity, charm and of course the dazzling blue Perak (head gear) that is a quintessential part of their costume. So make sure you grab a spot to photograph as it gets very crowded as the performance progresses. So have you been to Leh? What has been your most memorable experience? Let me know in the comments below. What a beautiful and colorful place. When is the best time to visit? Thanks Jeff. This is in Northern India and the best time to visit it is from May-September. Winters are harsh and most passes are blocked. Excellent summary and gorgeous photographs!! The landscapes of Leh are truly mesmerising! Hope you get to go there soon! You have got everything covered, Divsi. Such a detailed guide on Leh. And before I forget, the pictures are mesmerizing! Nice write-up on Leh…. Good coverage on nature, culture, people….. Good Photographs. Woah, really gorgeous photos that you have there! I will definitely bookmark this post for reference if I do get a chance to visit Leh! Leh is such a beautiful and lively city. Your post has brought back the memories of my trip to Leh. I missed on the vibrant Ladakhi dances. Your amazing pictures have perfectly captured the beauty and the vibes of the city. Your photos are quite intriguing! I would enjoy seeing the gorgeous views of Leh city and visiting the Naropa Festival. Beautiful blog post with enticing photos. Ladakh has been in my wishlist for so long and yet somehow havent been able to make it. I loved the post and it seems I feel the inner calling for visiting this place. I am praying it happens soon. Such a colourful, vibrant and wonderful place! Reading this was like a homecoming of sorts, having spent a week recently in Ladakh. The beautiful vistas once again danced through my mind reading your post. Of course need to head back to explore the place in greater detail. Apart from the unique landscapes, the monasteries of Leh are really fascinating. Exploring the interiors of Hemis monastery was fun, especially the upper floors. The Hemis museum too was a place to spend a lot of time, it is so rich in heritage. I have never been to Leh but I would so love to! I am in awe of the colorful interiors as against the rusty undyed landscape of the region. Such a helpful comprehensive post, Divsi, full of valuable tips and information. Your (gorgeous) pictures speak of the calming beauty and tranquility I so hope to experience for myself someday.